Indiana 431 once existed in two segments; the first was in Johnson and southern Marion County, serving as a "business route" for the former US 31 through Homecroft, Southport, and Greenwood. The second segment ran originally from Fall Creek Parkway (Old Indiana 37) north along Keystone Avenue through northern Indianapolis and into Carmel where it connected with U.S. 31 near Westfield. Over time, as the state and U.S. highways were moved to Interstate 465, Indiana 431 was decommissioned. The last stretch was decommissioned in 2007 as INDOT handed over the segment from Interstate 465 north to U.S. 31 to the city of Carmel. The city of Carmel, among the most affluent communities in the state and among the most innovative in transportation, over 50 roundabouts are present in the city, came up with a way to improve the road. For years, suburban growth had made the highway congested and INDOT had come up with a plan to widen the highway to six lanes and improve the intersections, potentially with diamond interchanges. When Carmel asked to have the highway, they came up with their own solution: They would keep the four lane configuration and turn all the intersections with elevated "teardrop" roundabout interchanges. The design allowed for Carmel to take up the least space possible and keep it like a freeway. After a few years of construction and a costly budget, the project was finished in 2010 and the effects have been immediate. The road feels like a freeway, it clearly isn't though, but it provides a quicker way from Interstate 465 to U.S. 31, and will serve as an alternate to that highway as it is improved into a freeway in the coming decade. Not surprisingly, some of the interchange designs for the new U.S. 31 freeway through Carmel and Westfield were inspired from the Keystone Parkway project. We begin at the exit ramp off of Interstate 465 westbound at the newly rebuilt parclo interchange between Interstate 465 and Keystone Avenue. On the interstate the road is only referred to as Keystone Avenue, the name of the road in Indianapolis. This new sign bridge directs traffic to both Indianapolis and Carmel and above the turning arrow signs the names of both Keystone Avenue and Keystone Parkway are present, directing traffic to either road. Photo taken 12/11/11. North of the Interstate 465 interchange, Keystone Avenue (given that we are still in Indianapolis) approaches the intersection with 96th Street. 96th Street is busy four-lane arterial that connects Keystone with Allisonville Road and Interstate 69. Because is straddles the county line between Hamilton and Marion Counties the intersection was not among the ones that were rebuilt. As of the date of this picture, the eastern half of Keystone Avenue approaching the intersection was still under construction, but once the project is finished; there will still be two stoplights, here and at 98th Street. Plans were announced in late 2011 to rebuild the Keystone/96th Street intersection into a roundabout interchange, similar to the rest of this parkway, but there is no word yet as to when that will be built. Photo taken 12/11/11. Past 96th Street, the road officially becomes Keystone Parkway and enters Hamilton County (population 274,569) and the city of Carmel (population 79,191). Hamilton County is the fastest growing county in Indiana and along with Carmel are the most affluent communities in the state. Here, Keystone Parkway has kept its six lanes from the Interstate 465 interchange, but the rightmost lane becomes an exit ramp to the 106th Street ramp. Photo taken 12/11/11. The rightmost lane of Keystone Parkway exits off to 106th Street. A roundabout facilitates movements between the ramp and 106th Street on both sides of the highway. Photo taken 12/11/11. A decorative overpass carries 106th Street under the depressed Keystone Parkway. 106th Street is one of the main west-east roads across Carmel. In Hamilton County, roads that end in a 6 represent the mile roads throughout the county, starting at 96th Street at the southern boundary and ending at 296th Street at the Hamilton-Tipton County line. The Hamilton County street and address system are both continuations of the Indianapolis-Marion County system. Photo taken 12/11/11. North of the 106th Street interchange along Keystone Parkway. Except for the interchanges, the rest of the road was untouched (other than being repaved). Photo taken 12/11/11. Now 1/4 mile away from the next interchange, with 116th Street and Carmel Drive. The spacing between interchanges is quite short, leaving little space between each and justifying the 50 MPH speed limit. Note the small blue sign below the guide sign; it is a mile marker from when the highway was Indiana 431, representing the 2 mile marker north of Interstate 465. Somehow the signs were kept. Photo taken 12/11/11. The exit ramp for both 116th Street and Carmel Drive heads off of Keystone Parkway. The ramp serves 116th Street first and then Carmel Drive. To get to Carmel Drive, one has to navigate the first roundabout and continue straight along Keystone Parkway to get to the second roundabout for Carmel Drive. Photo taken 12/11/11. The overpass for 116th Street over Keystone Parkway. 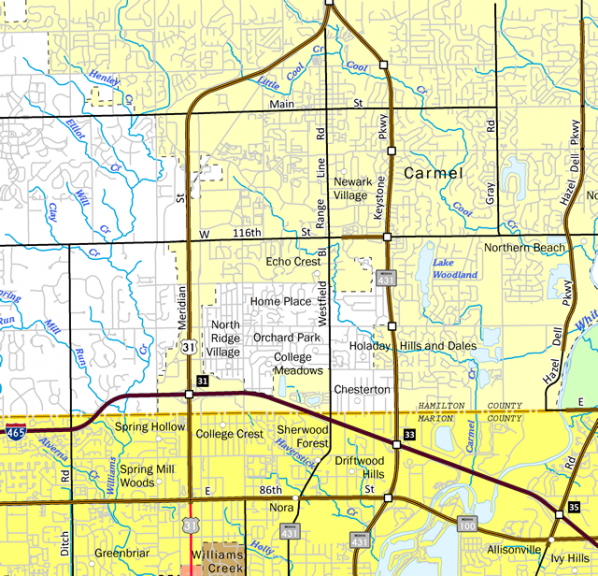 116th Street represents a major west-east road across southern Hamilton County, connecting with Oak Street (former Indiana 334) at Zionsville in Boone County with Olio Road in Fishers. En route, the road connects with U.S. 31, Allisonville Road, and Interstate 69. The road becomes the main west-east road across Fishers. Photo taken 12/11/11. North of the 116th Street overpass, the overpass for Carmel Drive is next. Carmel Drive is a more local road starting at 126th Street to the east and ending at Main Street to the west, winding through the heart of Carmel as a four-lane road. Photo taken 12/11/11. North of the Carmel Drive overpass, the entrance ramp from the Carmel Drive interchange onto Keystone Parkway becomes the exit ramp onto 126th Street, now 1/4 mile away. Photo taken 12/11/11. Now at the interchange with 126th Street along the Keystone Parkway. 126th Street provides the best access to the City Center part of Carmel and the Palladium at the Center for the Performing Arts. Photo taken 12/11/11. Now passing the 126th Street overpass. 126th Street is a more local road that connects with Hazel Dell Parkway to the east and City Center Drive to the west. Photo taken 12/11/11. North of 126th Street, the Keystone Parkway is now 1/8 of a mile from the Main Street interchange. Because of the closeness between the two interchanges, the entrance ramp off of 126th Street flows into the exit ramp onto Main Street. Photo taken 12/11/11. Keystone Parkway as it goes underneath the Main Street overpass. Main Street, which used to be called 131st Street to the east of Keystone Parkway, heads straight for Downtown Carmel and the Carmel Arts and Design District. Carmel has since renamed the 131st Street segment to Main Street. Photo taken 12/11/11. North of the Main Street interchange, 136th Street is 1/8 of a mile away. Photo taken 12/11/11. Now at the 136th Street interchange. As with the previous interchange, the entrance ramp from Main Street becomes the exit ramp onto 136th Street. Photo taken 12/11/11. Going underneath the 136th Street overpass. 136th Street is a local road that connects with U.S. 31 to the west and Gray Road to the east, providing access to St. Vincent's Carmel Hospital and Carmel High School's football stadium. Photo taken 12/11/11. The next and final ramp along Keystone Parkway connects with 146th Street. Interestingly, the entrance ramp from 136th Street is removed just before the lane reappears for the exit ramp onto 146th Street, forcing traffic to merge with the regular two lanes of through traffic just to exit back off a few hundred feet later. Photo taken 12/11/11. Now at the 146th Street ramp. This exit ramp was built a few years back while the road was still Indiana 431 and was built to connect northbound Keystone Parkway traffic with 146th Street, a major four-lane west-east road that connects Carmel and Westfield with Noblesville and Fishers to Interstate 69 at Campus Parkway. The road is often considered the northern leg of a second Indianapolis beltway, despite not being a freeway at all. Photo taken 12/11/11. North of the 146th Street, Keystone Parkway retains to its original state as it approaches U.S. 31. Photo taken 12/11/11. Keystone Parkway goes down to one lane as it becomes an entrance ramp onto U.S. 31 north. This interchange will be changed when U.S. 31 is converted to a freeway, but the movements between Keystone Parkway and U.S. 31 will remain the same, albeit rebuilt to accommodate the ramps from U.S. 31 to Greyhound Pass and 151st Street. Photo taken 12/11/11.